Here's a simple and easy tofu stir fry recipe. Pan-fried tofu is cooked with celery and fresh wood ear mushrooms. Quick and delicious. That's it! 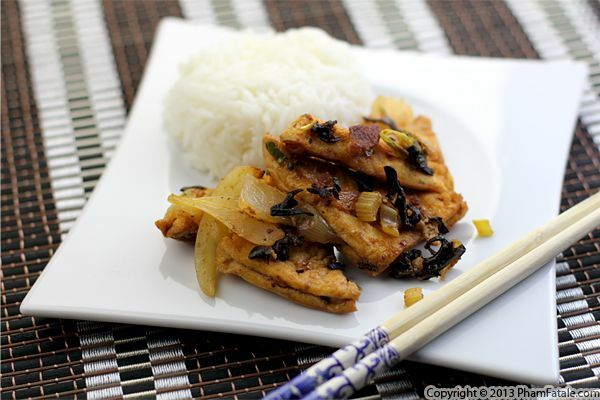 The Asian New Year is Sunday, and as you may have noticed, I've been cooking a lot of tofu dishes over the past few days. Next I'll share with you some of my favorite New Year's desserts. Stay tuned! This year, the Asian New Year celebration (called Tết in Vietnamese) will happen during the first week of February, according to the Lunar calendar. I've mentioned in the past that, traditionally, you're required to eat vegetarian food (ăn chay) on the last day of the previous year and the first day of New Year. 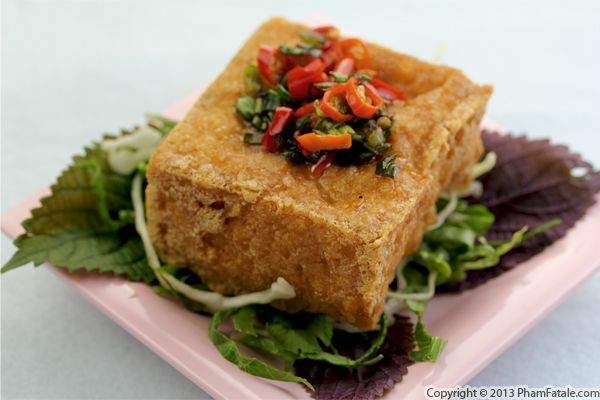 Today, I'm sharing a vegan dish called kiểm that's a staple during the celebration. 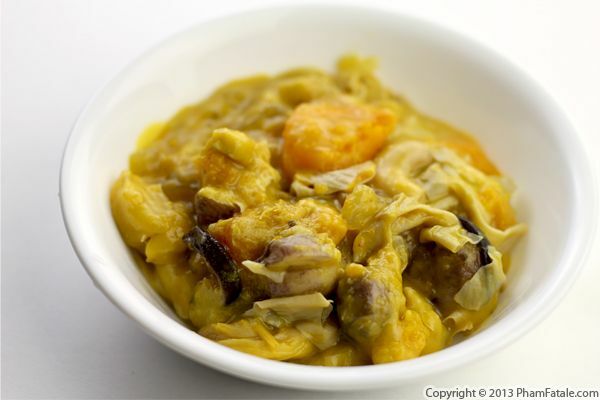 The dish is a sweet, savory soup made of pumpkin, bananas, coconut milk, mung beans, lotus seeds, wood ear mushrooms, sweet potatoes, ginger, tofu and raw peanuts. This is not a very common dish and it's only made for the celebration. If you know its origin, please let me know in the feedback section. The winner of this week's giveaway is Amanda O. Congratulations and I hope you enjoy using my first cookbook about gourmet potato dishes as much I did developing the recipes! This is a simple vegetarian recipe, but simple doesn't mean that it lacks flavor. 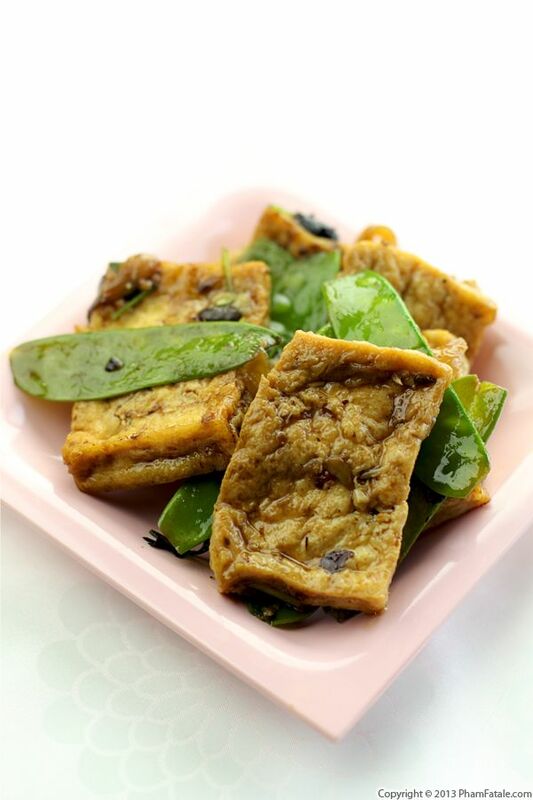 I pan-fried thick slices of tofu until the outer layer was very crispy, then quickly sautéed it with fermented black beans and snow peas. The greens were still crisp and provided a great color to the dish. 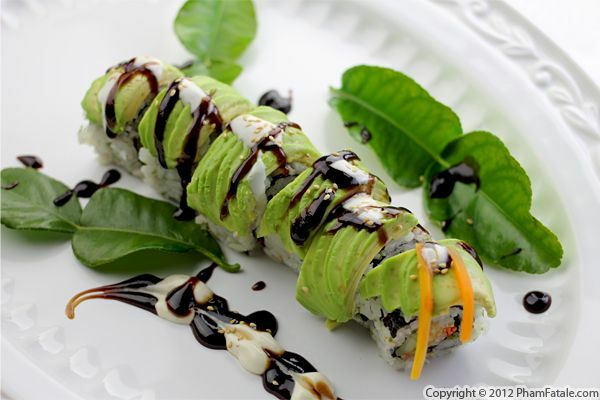 If you're starting to think about the upcoming Asian New Year celebration (called Tết in Vietnamese), you might be looking for vegan recipes. Well, search no more! Tradition requires us to eat vegetarian food (ăn chay) on the last day of the previous year and first day of New Year and I will be sharing a few more Vietnamese vegetarian dishes with you until the celebration begins. Page 17 of 23 pages.